Ingredients: Noodles: Water, Corn Starch (8.8%), Potato Starch (2.8%), Pea Starch (2.4%). Oil Sachet: Rapeseed Oil, Peanut, Fermented Soyabean (Soyabean, Water, Salt), Chilli (12%), Sichuan Peppercorn (2%), Sesame, Flavouring, Flavour Enhancer (E621, E635), Preservative (E202). Sauce Sachet: Water, Soya Sauce (Water, Soyabean, Salt, Bran, Wheat Flour), Salt, Preservative (E202). Vegetable Sachet: Fungus, Gong Cai Vegetable, Bamboo, Acidity Regulator (E330). 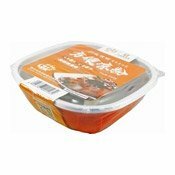 Simply enter your details below and we will send you an e-mail when “Cold Starch Bowl Noodles (Spicy Hotpot) (川北方便涼粉 (麻辣醬))” is back in stock!